Friday night was the First Annual Brown Family Luau. An Elementary School Dance. My first. So I signed up to work it. And it was 20 degrees when the time finally came. 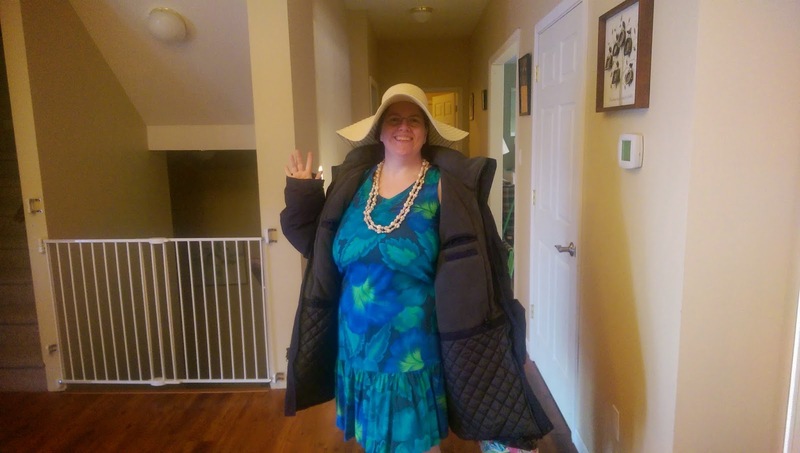 Who's crazy enough to wear a muumuu when it's 20 degrees outside? Me. Like it? It's autumn sunrise. I was working hard at the ticket table when these sweetboys arrived to help me out. I got to take tickets. Good thing, because as I was doing so, I learned that siblings were not invited. So I had to call Eric and tell him that Jacob wasn't welcome. :( So Eric offered to stay home with Jake while I continued and he sent the boys in. They helped me take tickets for a while, but they'd also run to the gym to dance and grab snacks. All the kids were given leis and sunglasses for the luau. It was so much fun, and I had barely made it into the gym for the dancing. But oh yeah, it's a good time. Chris and I got in line for the Limbo. This was his practice move. Chris was actually doing really great in the Limbo, he made it through 3 rounds before falling to his his hands. I was really proud of him. I got a great opportunity to dance with Sam too. He's such a lightweight, he loved spinning around, or having me twist him while we danced. The only thing that would have made it better is if I'd had a 'drinkie' before I'd arrived. It was like the most fun wedding reception, but with more kids! Here are my special Luau dates and I after we arrived home. When I stopped moving, I learned, I need to be in better shape before next year's dance.